Sold by the artist c. 1872 to (Durand-Ruel, New York and Paris). Hiltbrunner Collection, by 1887. (Durand-Ruel, New York and Paris). John G. Johnson [1841-1917], Philadelphia, by 1888; sold 1899 to Peter A. B. Widener [1834-1915], Elkins Park, Pennsylvania; Inheritance from the Estate of Peter A. B. Widener by gift through power of appointment of Joseph E. Widener, Elkins Park; gift 1942 to NGA. Exposition universelle, Paris, 1867, no. 526. Sixth Exhibition of the Society of French Artists, Durand-Ruel, London, 1873, no. 118. Celebrated Paintings by Great French Masters, National Academy of Design, New York, 1887, no. 57. Exposition de tableaux, pastels, dessins par M. Puvis de Chavannes, Galeries Durand Ruel, Paris, 1887, no. 15. 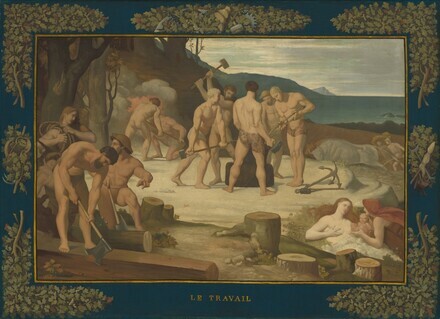 Puvis de Chavannes, Palais du Louvre, Paris; National Gallery of Canada, Ottawa, 1976-1977, no. 41. Impressionist and Post-Impressionist Masterpieces from the National Gallery of Art, Washington, State Hermitage Museum, Leningrad; State Pushkin Museum of Fine Arts, Moscow, 1986, no. 25, repro. Pierre Puvis de Chavannes, Rijksmuseum Vincent van Gogh, Amsterdam, 1994, no. 28, repro. Arcadia by the Shore: The Mythic World of Puvis de Chavannes, The Bunkamura Museum of Art, Tokyo; Shimane Art Museum, Matsue, 2014, no. 12, repro. Paintings in the Collection of Joseph Widener at Lynnewood Hall. Intro. by Wilhelm R. Valentiner. Elkins Park, Pennsylvania, 1931: 196, repro. Paintings and Sculpture from the Widener Collection. National Gallery of Art, Washington, 1948 (reprinted 1959): 100, repro. Summary Catalogue of European Paintings and Sculpture. National Gallery of Art, Washington, 1965: 106. European Paintings and Sculpture, Illustrations. National Gallery of Art, Washington, 1968: 93, repro. European Paintings: An Illustrated Summary Catalogue. National Gallery of Art, Washington, 1975: 276, repro. European Paintings: An Illustrated Catalogue. National Gallery of Art, Washington, 1985: 321, repro.